What Is a Health Insurance Agent? Sometimes referred to as producers or representatives, health insurance agents are licensed and regulated at the state level and help individuals and families find plans that fit their needs. Typically, health insurance agents work with a single health insurance company and represent the company rather than the applicant. Purchasing a health care plan is just the start of a relationship between you and your agent. Your needs will change as your family grows and ages, and having a reliable advocate in your corner can make a tremendous difference in navigating the complex world of health insurance coverage. Is a Health Insurance Agent necessary? Yes, you should be using a health insurance agent (or health insurance broker) to find the right plan for you or your family. For starters, using a health insurance agent does not cost you a dime, and can actually end up saving you money with their experience, and knowledge of subsidy programs available to you. Good insurance agents will put your needs above anything else. Professional agents understand the intimidating world of insurance coverage and know how to find a policy that will address those aspects that are important to you and your family. Most of the services health insurance agents provide are free to you because the commission they earn has already been included in the total price of the policy. Therefore, there is no additional cost to have someone who is educated and knowledgeable help you find a great health insurance plan. Agents make your policy easy to understand and are there to help whenever you have a question or concern. 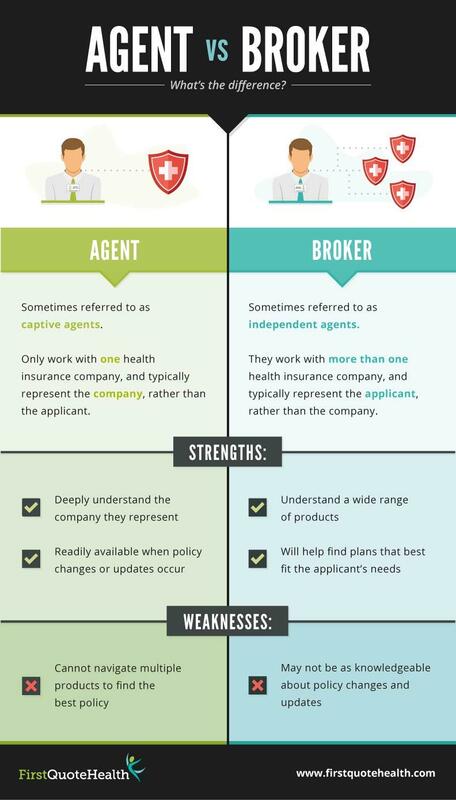 Choosing the right Insurance Agent. Honesty is one of the most important values of great insurance agents. You want to work with someone who will help you weigh the pros and cons of each policy option and tell you when something is not right for you. Agents should have excellent communication skills, and providing good customer service should be the foundation of every interaction with you. They should know their products inside and out, and they should pay close attention to the important details of what you're looking for in a healthcare policy. You want someone who will be a steadfast advocate for you and work with you on your health insurance goals. Start your health search today and see how much you can save by entering your zip code, or talk to one of our experienced agents right now 858-771-4087!